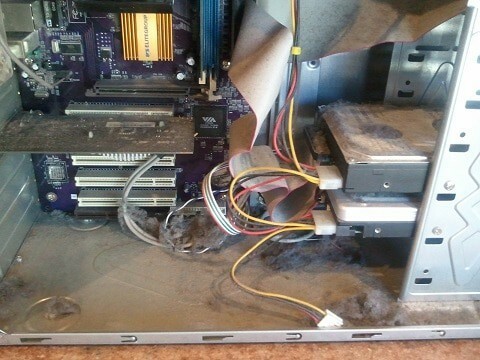 Some of us have had the opportunity to learn the lesson the hard way: a computer needs to be cleaned regularly, although we discourage doing it with a leaf blower, no matter how satisfying it might seem to you. Internal components need to be cleaned since they need to remain dust-free in order to remain properly cooled, lest their lifespan becomes significantly reduced. Peripherals, on the other hand, should be kept clean for mostly hygienic reasons. This guide will be devoted exclusively to this – helping you keep your gaming setup clean and operational. But what do you use to clean your PC? And more importantly, how can you clean it safely and properly? We will answer that, and more, below. Cleaning a computer case is a rather simple process. You will only be using compressed air, plus any sort of cloth and brush, and potentially a screwdriver to open the case. You may also need cotton swabs and some alcohol for case-mounted fans. Remove the left side panel by unscrewing the screws on the back. Some cases come with screws that include special rubber or plastic caps to allow the user to remove them by hand. The dirtiest parts of a case are usually the top and the bottom, as the majority of dust will end up settling there. Use a cloth to wipe this dust away. If the bottom of the case has gathered up a significant amount of dust, you may want to use a vacuum cleaner. Getting dust out of the hard to reach places is most easily achieved with the help of a can of compressed air. You can use it to blow dust out of the drive racks and fan grilles on either the front or the back. If your case is equipped with dust filters, you will want to clean them also. This can easily be done with either a can of compressed air or a brush. If your case has fans mounted on it, the biggest problem will be getting rid of the dust stuck to the fan blades. You may need to remove the fans from the case if they are hard to reach. To clean them, simply dip a cotton swab in alcohol and rub away! In this section, we will take a look at how to clean a CPU, a GPU, a power supply, along with everything else that’s inside your computer case. A screwdriver – Not used for cleaning but for removing certain components or disassembling the entire PC, if need be. Either a slot or a cross-slot screwdriver will be fine. A can of compressed air – The best way to get built-up dust out of a heatsink and out of hard to reach places. It should not be shaken and should always be held in an upright position to prevent liquid air from escaping. If you want to clean your PC without compressed air, that is definitely doable, although it can be more tedious. 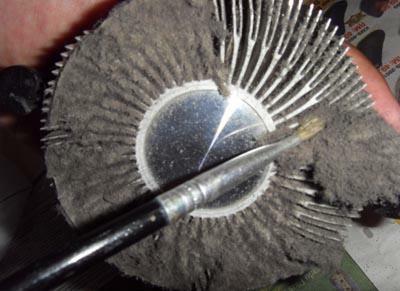 A soft brush – Used for getting the dust off of circuit boards and heatsinks. Cotton swabs and rubbing alcohol – For getting rid of stubborn pockets of dust in tight spots. Now that you have all the gear that you need, let’s get to work! First of all, you should unplug the power supply. It is important that the PC is not powered and has had time to cool off before you start cleaning. Disconnect the cooler from the motherboard and take it out of the case. Push pins are the most common way of keeping a CPU cooler in place today, but if you have a different one, be sure to check the manufacturer’s site or the guide on how to properly remove it. Hold the fan blades in place while you use the compressed air to blow out the dust from the heatsink. The high air pressure forcing the fan to spin might damage the bearing. Brush out remaining dust from the fan itself. Use the cotton swabs and alcohol to get rid of any dust that is still stuck to the fan blades. After this, use the brush to clean out the dust on and around the socket prior to putting the cooler back. You do not need to remove the CPU in order to do this. Cleaning your graphics card is even simpler than cleaning the CPU. You can do it without actually having to remove the card from the case, but we recommend doing so if you want to clean it thoroughly. Remove the safety screws on the case and pull the card out with both hands. Also, make sure that the PCIe slot’s safety bracket is not holding the card in place. As before, hold the fan(s) to prevent them from spinning while you blow out the dust with the compressed air can. If it is a graphics card with a blower fan, it is best to blow the air through the back of the card. Use the brush to clean the backplate. If you have a card without a backplate, be sure to brush gently so as not to damage the circuit board. Once again, use the cotton swabs and rubbing alcohol to remove the remaining dust from the fan blades. On the other hand, if you don’t want to remove the graphics card from its slot, simply use the compressed air can to blow air into the back of the card and watch the built-up dust from inside the heatsink fly right out. When doing this, make sure that the can remains in an upright position so that no liquid air escapes, as it may damage the graphics card. 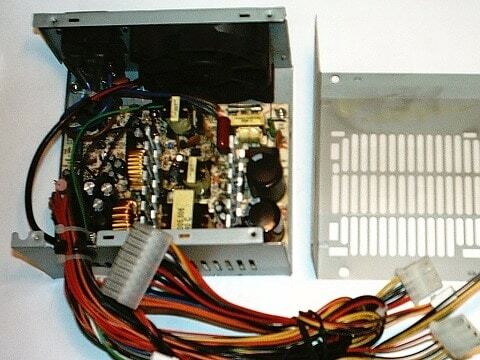 The PSU can be cleaned with or without removing it from the case, but also with or without opening it. Disconnect all the power connectors from other components. When disconnecting connectors, make sure that they are not held in place by a safety pin. If you’re having trouble getting the connector to come loose, try wiggling it gently left and right while holding the motherboard down. Remove the safety screws and take the PSU out of the case. Push the screwdriver through the fan grille to prevent the fan from spinning. Use the compressed air can to blow out the dust. Make sure to do so from different angles several times to ensure that no dust remains trapped inside. Remove the screws holding the PSU cover in place and remove it. Use the brush or compressed air can to get rid of the dust built up inside. The motherboard itself doesn’t need much cleaning since its usually vertical positioning prevents the dust from building up anywhere but on top of the heatsinks, as well as on top of the protruding PCIe and RAM slots, as well as on top of the rear panel ports. As such, if your motherboard is positioned vertically, all that you need to do is a bit of light brushing. If your motherboard is positioned horizontally, then dust is likely to have built up inside some of the unused PCIe and RAM slots. In this case, you only need the brush once again. Simply gently brush the ports to get the dust out. You may also use compressed air or blow the air out yourself, but this is hardly ever necessary. HDD/SSD – Neither hard-disk drives nor solid-state drives need internal airflow to remain cool, so all that you need to do is brush away any dust that has gathered on them. RAM modules – Once again, RAM doesn’t have any active cooling apart from the heatsink which is easy to clean with just a brush. PCIe expansion cards – If you have a sound card, a network card, or any other type of PCIe expansion card, they can also be cleaned easily with just a brush. In the unlikely case that it is a large card with an active fan, you can clean it the same way as you did the graphics card. Luckily, the peripherals are much easier to clean than the internal components are, mainly because you do not need to handle any sensitive hardware. 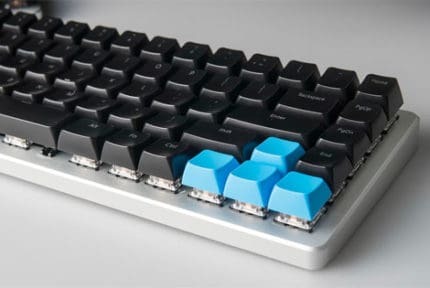 Cleaning a membrane keyboard and a mechanical keyboard comes down to a largely identical process, and you can do it with or without removing the keys. Whatever the case, you will need a piece of cloth, rubbing alcohol, cotton swabs, and a can of compressed air. 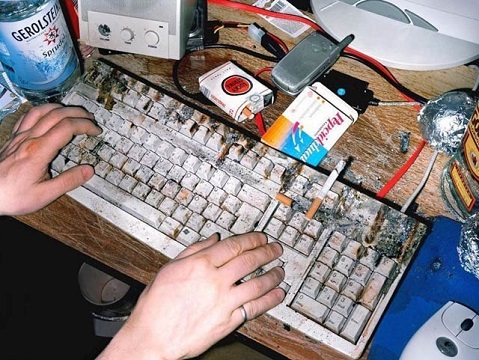 Hold the keyboard upside down as you use the compressed air to blow out any dust and debris. Dip the cloth in alcohol and rub the main body of the keyboard clean, including the space between individual keys, as well as the keys themselves. Optionally, if you want to clean the area under the keys (which might be a good idea if you haven’t cleaned your keyboard in a while), you will need to remove the keys first. This can be done by pushing any thin object underneath a key to dislodge it, be it a screwdriver, a ruler, or even a knife. Once the keys are off, use cotton swabs dipped in alcohol to clean the area. The mouse is perhaps the easiest peripheral to clean. All you will need is a piece of cloth and rubbing alcohol. Simply dip the cloth in alcohol as before and scrub the mouse clean. You may once again use a thin object to get any built-up dirt out of the mouse’s crevices. For cleaning the monitor, you will need a special microfiber cloth so that the screen doesn’t get scratched. Apart from that, you might also need rubbing alcohol or distilled water to get rid of any persistent clumps of dirt. Alternatively, you can use special screen wipes which are quite cheap and which you can buy in almost any tech store. Use the microfiber cloth to gently wipe away the dust with straight vertical or horizontal movements. If you encounter clumps of dirt that won’t come off, do not use force. That is a very easy way to damage the screen. Instead, dip a tiny bit of cloth in alcohol or distilled water and gently rub the hardened debris until it comes off. 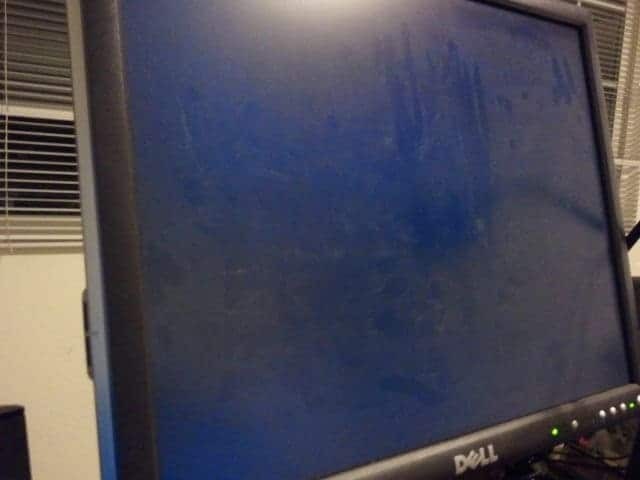 You can use any type of cloth or brush to wipe the dust off the other parts of the monitor. As above, use a screen wipe to wipe away the dust with straight vertical or horizontal movements. Based on the type of screen wipes, you may need to use a microfiber cloth to dry the screen since some solutions do not evaporate immediately and might cause smudging. As for other peripherals such as speakers, headphones, or microphones, you can simply use a brush to get rid of dust, potentially scrubbing any persistent dirt buildups with a cloth and alcohol. And there you have it, a complete step-by-step guide on how to clean a PC! If you stick to the above steps, you will be able to clean your PC instantly, and with no risk of damaging any of the more sensitive parts. So, brush away and enjoy what will feel like a completely new computer – cooler, quieter, and faster.